Zoiks! Hey how are you doing? Graham Colton: I’m good man how are you? Z! : Pretty good, thanks for taking the time to do this. GC: No, thank you, I very much appreciate it. Z! 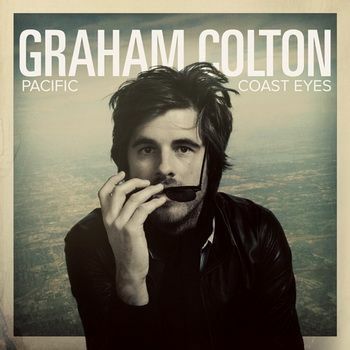 : How would you describe the new album “Pacific Coast Eyes” to fans that haven’t heard it yet? GC: I start all of my songs with the acoustic guitar. Being a song writer first and a singer second I would say that there is always an acoustic element of some sort in my songs. I think that comes out on the new album much more so than my last record. In away I think it really goes back to basics compared to some of my earlier work. As I’ve learned a lot along the way and had some success, one of the things I’ve learned is that some of the most honest stuff and some of the best stuff I’ve done was early in my career when I didn’t really know what I was doing. A lot of the songs that made this album, that spoke the loudest, had a lot of those same characteristics. It remained very innocent and simple. Z! : When you write a song do you need to be in a certain mental state, do you need to feel inspired if you will, or can you pretty much come up with something any time. GC: No actually, the first thing you said is exactly how I do it. I mean I am a writer, so I do sit down and attempt to pick up the guitar and write something, but it seems like the most important songs that ended up making my album, fell out of the sky. Z! : What if anything did you do differently this time around in terms of preparing, writing, recording etc? GC: Everything was different this time around just because it was my first independent release. I was on Universal Records from 2002 to 2008 and released two albums, we had a great experience. I feel like I kind of caught the tail end of the old music business and was absorbed into…what’s the write word? Kind of started in the new music business from my first album to my second album. I’m really fortunate that there is that history, but the making of this album was certainly…I had complete creative control; I worked with all of my friends, no big studio, no big budget. I basically got to do whatever the hell I wanted to do. In a way it was the easiest most fun experience, but I still wanted to raise the bar from my previous work, so I raised the bar for myself and took a lot of time making it. GC: I would say both. I think there is more opportunity than there has ever been…to get it out there, but at the same time it means that there is just so much music available to anyone at any time that it is so much harder to connect with people. I hope that makes sense. I guess it’s easier to connect with people and get your music heard, but it’s harder at the same time, because it’s not like it was 15 years ago, even 10 years ago. Anybody that was signed kind of had that validation and you go to the record store and look at the new releases and say hey that looks kind of interesting and pick that up. Z! : Now the fans gets to choose. GC: Yeah, now everything is digital and it’s a whole new world out there, but it’s exciting, because a lot of those fans have grown with me and have really supported me in this transition and it’s a really exciting thing. Z! : So, you did the album independently, but you came off of you last album with some success. Did you feel any added pressure for this album, were you still riding the momentum from your previous album? GC: I did feel pressure, like I said I put a lot of pressure on myself to raise the bar, but the difficult thing is in order to raise the bar I didn’t want to make the album I made last time again. I had a lot of success with television; with songs on TV shows and that was certainly an eye opening experience for me, because you almost see the song on the big screen, which is really cool. It use to be, that I have to write an album, but it’s got to have one or two tracks that I can hear on the radio, now there’s all these other channels in the media that your music really can not only exist in, but take off like a rocket. Having that success is a lot of pressure to follow up and continue what you’ve already done, but I wanted to come from a different place. I didn’t want to write “Best Days” again. I didn’t want to do another version of a song I’ve already written. Z! : You’ve played with some big names, and like you said your music has been on TV. You’ve been in the public eye for a few years now, how has that exposure affected you both personally and professionally? GC: What’s interesting is that my first major label release came out in 2004, but I was touring in 2002 with a demo CD I had released. I was lucky enough to be touring with The Counting Crows, Dave Matthews, Better Than Ezra, John Mayer, Maroon 5 etc. So really the start of everything way before TV was touring. I’m really getting back to that, to the idea that if TV shows want to play the music great. I’ve gotten to experience both, I’ve gotten to experience hearing my song on the radio, but the number one thing that I think has the biggest impact, small show or big show is connecting with people one on one. That’s what I’m going to attempt to do in the next couple of years. Z! : You mentioned playing with The Counting Crows, they’re kind of responsible for discovering you correct? Could you tell us a little bit about how that went down? GC: Adam (Duritz), the singer, he had his own record label for awhile, years ago. So I think he loves to find, develop and nurture new artists. The way he does that is he brings them out on tour with them. Same with Better Than Ezra, I don’t know if you’re familiar with them? GC: They were a huge band and still are really trusted friends of mine that have helped me and still help me, I just played with them on Saturday night. Z! : Who would you say is your earliest musical influence? GC: I would say my earliest musical influence is probably Tom Petty and of course The Beatles. My dad played in a 60’s and 70’s cover band…and still actually does play in that band with all of his buddies (laughs). There was always cool music around the house. Music never really took over until the post grunge mid to late 90’s music scene when I was 12, 13. 14 when I was into music. You know, bands like Counting Crows, The Wallflowers, Oasis, The Verve, Better Than Ezra. It just seemed like there were bands that were just playing really great three and a half minute songs with guitars, bass, piano and drums. The reminded me of the greats, Fleetwood Mac, Tom Petty, and The Beatles. I thought to myself, ‘man this is kind of a new version of what I was raised on,’ so that was when I knew this was what I wanted to do. Z! : What was your most memorable concert experience growing up? GC: My first concert was probably my most memorable. I was eleven and I went to see Paul McCartney in Kansas City at the big football stadium there on his world tour. That was a moment I will never forget. It was the first enormous rock n roll concert I’d been to and it was definitely magical. Z! : What are your upcoming tour plans? GC: Yeah, I leave Thursday. I just got home a couple of days ago. This summer is going to be a lot of three, four and five shows in a row, then I’ll go to LA or go home and continue to just bounce around. In the fall we’ll have a continuous tour that will last weeks. GC: It’s always different. Now I feel like I have enough songs that people know that I can change the set list every nice. There’s always a moment in all of my shows whether it’s full band or acoustic where I’ll take requests from the audience (laughs). I’ll attempt to play the songs. A lot of times my fans will request really obscure songs that I don’t remember how to play and I have to fumble through it, but it’s kind of fun. I just love playing shows. Z! : What has been your proudest moment so far in your career? GC: Oh man, that’s really hard to say. I would have to say probably playing Letterman, just because it was the same stage The Beatles played on. Z! You’ve seen the change in the music industry first hand, what would you recommend to up and coming artists trying to break through in the new music industry? GC: Dude, it’s all about the Internet now. I was lucky enough to have songs that were accidentally on Napster and people started downloading them. The number one thing now is to use the Internet and not be so precious with your music. It doesn’t have to exist in the form of an album, it doesn’t have to exist in a six song EP, it doesn’t have to be perfect even. I even have to relearn all of this. I have to relearn how to put music out there and what people expect.